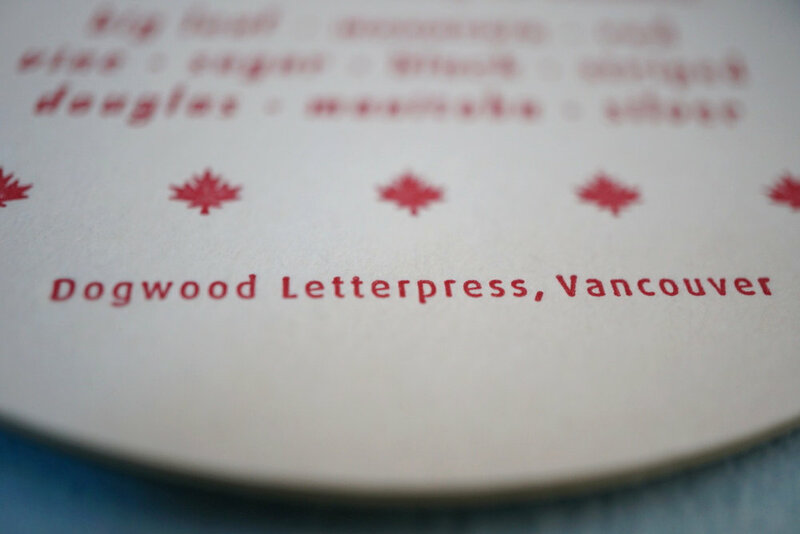 Welcome to the second part of our interview with Dogwood Letterpress! In case you missed it, you can find part one here! What is the process of making a letterpress print? Our concepts always start with hand-drawn sketches: pencil, pen & paper! Depending on the project aim, a sketch might be transferred to a linoleum block, and carved. When you carve in lino, you must think in reverse: carve away the area that does not print. Sounds easy, right? It takes a little practice. [SIDE NOTE: If you feel inspired to try it out, please do remember the cardinal rule is to always carve AWAY from yourself, and never put your free hand in the way of the tools!] Linocuts tend to flatten & wear rather quickly with deep impression work, so we often do a clean black print from the linocut that can be scanned & turned into a photopolymer (UV-exposed plastic resin) plate, allowing for longer print runs. In the case of type, we love hand-setting metal type whenever possible. The type case is opened, and we create the text letter by letter using a composing stick, furniture and quoins to hold it all together. On metal type runs, we reduce the impression to preserve our type, or, sometimes we will set type digitally and have a photopolymer plate made, as described earlier with respect to linocuts. 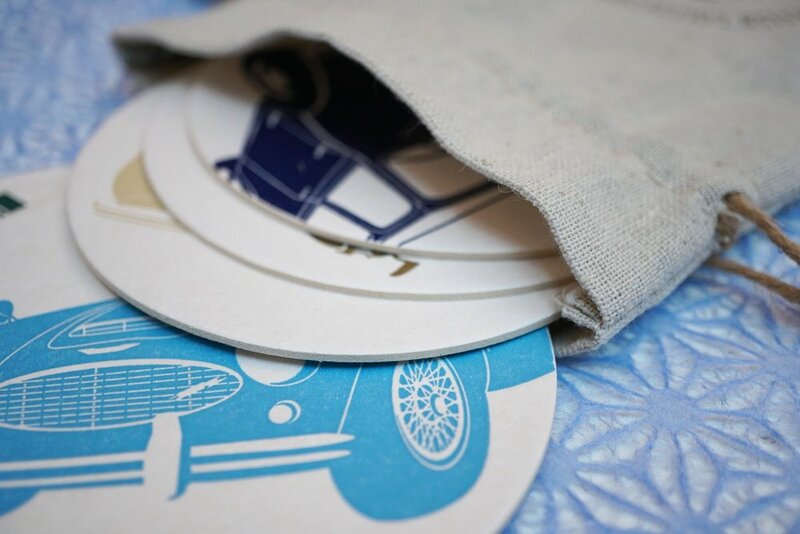 The beauty of the letterpress process is that you can combine a variety of plate types (metal type, or photopolymer, or lino, or wood type) into one print job. Once your plate is ready, you must make sure that the form (the assembly of relief surfaces that are to print) is even, flat, and locked into a chase (a metal frame that holds all of it together), and ready to be put on press. Makeready includes a variety of preparations to make sure the form prints evenly with appropriate pressure, the ink is applied, and guides are in place to position where the paper is fed. The actual printing of the piece with the press running takes less time than the creative, preparation, makeready & clean-up involved with a particular print job! But once everything is in place, you can begin the print run. Multiple colour pieces will involve a set up & print run for each colour that you print. We choose based on the quality of the material, and concern for waste & sustainable production. Paper mills are surprisingly mindful of environmentally-sensitive practices these days. We buy only from mills that use certified, sustainable processes, and we buy Canadian as often as possible. Our materials & parts suppliers are based in Canada & the USA. What vision do you have when you create your designs? We imagine the end user of our stationery products penning a hand-written message to a colleague, friend, or family member. We try to create designs worthy of a message that will be appreciated & saved by the recipient for possibly years to come. We hope the enjoyment is two-part: the physical process of the pen gliding across cotton paper, and the opening of an envelope and reading of a message. Hopefully the texture and design details add something special to the exchange of handwritten notes that’s becoming increasingly unique in our digital world! Tell us more about Dogwood Letterpress. How did it start? What is it like to work there? Where do you see yourselves in the future? Dogwood Letterpress started out of passion for the texture of letterpress printing, and love of written communication. There’s quite a movement to keep the written word alive & vibrant, with all sorts of thriving pen-pal networks, greeting card sections in all sizes of stores across the country, and lots of great Canadian companies producing products that encourage people to WRITE! We are passionate about how the texture of letterpress printing and written communication provide a welcome break from the digital world. We are a small company, but growing. At the moment, our cards can be found in shops across the country, as far East as Saint John. Recently, we created our first French greeting card for a Montréal stockist. I think what we relish most is the relationships that evolve out of running a growing creative business that specializes in human communication: we love meeting new people. My day at Dogwood Letterpress is likely typical of that of the Canadian small business entrepreneur: lots of hats to wear! A little business-building; some design; some production (printing, finishing, packing); some shipping; a bit of accounting; some email; a dash of social media; and an effort to keep the big picture in mind, which is that our product must be worthy of people’s time & money. We want our product to be of the finest quality we can possibly offer: you’ve decided to make somebody else’s day with a hand-written note, so our product should be worthy of your effort. We are hoping our future includes more of the kind of creative and printing that we do today, with more Canadians writing notes on letterpress cards made by Canadian printers in an industry that is alive and well! Thank you, Dogwood Letterpress, for your insight into the world of letterpress!